who knew it was quinoa? It all started with Good to the Grain, a cookbook that features multiple grains/flours, such as oat, amaranth, corn, buckwheat, etc… The book came out in 2010, before these flours were available in most grocery stores, and I remember placing a rather large order with Bob’s Red Mill to get the lesser-known varieties (teff, kamut) shipped to my door. Over the years, the amount of baking I’ve done has decreased for multiple reasons, including time constraints in my schedule, ascribing to a more ‘paleo’ style diet (no grains) and a desire to be healthier overall (decreasing added sugars). However, I really love to bake and do still indulge in both decadent treats and healthier baked goods from time to time. I’m getting off topic. Quinoa. Back to quinoa. ANYWAY, I’ve been experiencing an on-again, off-again push to–once and for all–use up all those alternative baking flours that are taking up space in my freezer and keep my collection limited to those flours used most often in paleo-style baking and that yield a good product. The ‘baking-with-ancient-grains’ ride has been fun (and informative! ), but I’ve gotta simplify. Quinoa flour, which boasts it’s own chapter in Good to the Grain, has a strong flavor of…dirt. I said it. In addition to the fiber and protein quinoa flour adds to your product, it also adds a certain ‘earthiness’ that’s hard to disguise. I’ve made quinoa-beet pancakes, quinoa-pumpkin pancakes and many other things and I can still taste the flour a bit more than I’d like, and I’m pretty accepting of less-than-perfect products. 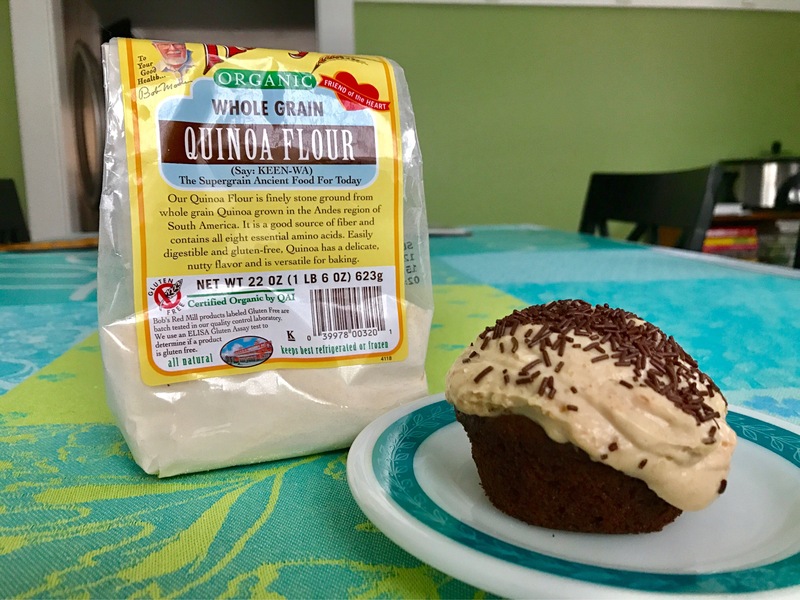 So when I spied the recipe on the back of the bag for chocolate cupcakes, I realized I’d been going about this quinoa flour thing all wrong. I needed an equally strong flavor to balance out the quinoa! (Apparently, beets aren’t strong enough.) CHOCOLATE. Place the butter and water in a saucepan. Bring to a boil, remove from heat and whisk in the cocoa powder. Sift together the sugar, quinoa flour, baking powder, baking soda and salt. Add the cooled cocoa mixture, egg yolks, vanilla and sour cream and blend well. Beat the egg whites until stiff but not dry. Fold into batter. Spoon into a muffin tin lined with paper cupcake liners. Bake for 20 minutes, or until a cake tester inserted in center comes out clean. I actually ended up making these cupcakes twice in one weekend–once to bring to a friend’s house, topped with Ina’s Chocolate Frosting, and another batch to my sister-in-law’s house for the Super Bowl, topped with this peanut butter frosting from Sally’s Baking Addiction. I was shocked at how well the cupcakes turned out! Not a hint of quinoa flour at all! (Not that it’s all bad, but you’ve gotta know your audience with some of these ‘healthy subs’ and believe me when I tell you I faced two tough crowds this weekend. So, moral of the story: give quinoa a try! Just make sure to throw in a little chocolate, too. Posted on February 7, 2017 by thehealthypineapplePosted in SweetsTagged baking, barefoot contessa, bob's red mill, chocolate quinoa cupcakes, cupcakes, Good to the Grain, healthy peanut butter frosting, Ina Garten, paleo baking, quinoa, quinoa flour, Sally's Baking Addiction, sour cream fudge cupcakes.